Thus concludes the Brisbane Writers Festival. An odd thing happened yesterday. I got a call from festival publicity who connected me to a journalist writing for the Australian who wanted to talk to me. I'm already on my way out of the house to my evening session at the Powerhouse, with the plan to take on board a couple of 'looseners' with my pal White, chairman for the session, on the way. Anyway, she arranges to come round for a quick interview. A cameraman arrives first, catching me unawares; he's taken fifty pictures by the time the journalist arrives and settles down with her notepad. I suddenly recall where I've seen her name in the last week: Rosemary Sorensen, arts writer for the Australian, wrote a negative review of Nicki Greenberg's Great Gatsby just a few days ago, ending it on a very peculiar note, 'Shaun Tan says... (quoting his praising blurb)... but then he would, wouldn't he.' Shaun told me yesterday that he would have considered it fair play if she reviewed his own book and criticised some structural aspect of it, but to snidely dismiss his personal taste in a review of another person's book was unseemly (I can't recall Shaun's actual words). She arrived with the definite idea that the 'graphic novel' is preposterous pretense at literary seriousness and was putting me on the spot to prove otherwise. I put up a vigorous and intelligent defence. I shall let you know if it makes print. Meanwhile, a quick tally shows that I have now promoted the cause in eleven separate public 'events,' and managed to mention my own books too whenever I saw the chance, since I posted the Melbourne Age article here three weeks ago. 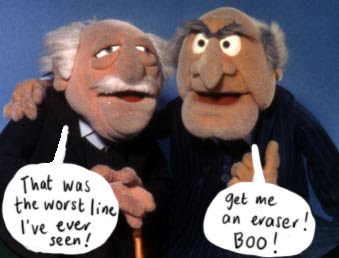 Can you imagine how many 'looseners' that entails? pps. And a big round of appreciation to the lovely Cori Stewart, who fought to get the 'graphic novel' into the Brisbane show this year, and who organised all the events while sweetly putting up with my curmudgeonly rants. Bless you. The panels last night went very well. 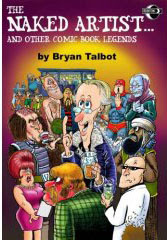 It was great just having a public conversation with Bryan Talbot for an hour. If you want a hint of what that might be like you should check out his new book, The Naked Artist, certainly relevant to the title and theme of my blog. It is a compendium of the anecdotes that comic book artists tell each other, gathered from hither and yon during Bryan's multifarious travels around the globe. I personally have had a drink or two with Bryan on at least three continents and we have dined together with the wives of our bosoms. One of my own yarns even pops up in here, the one about my meeting with the great Hugo Pratt, which I was telling as a bar anecdote long before I put it into my own book How to be an Artist. Some of the stories have been so exaggerated through retelling as to be near mythical. Others are quite charming such as the one where where innocent passerby Harvey Kurtzman is dragged into a swimming pool at the El Cortez hotel in 1977 by Linda Gebbie and two other female cartoonsists. A fanboy hears the splash and looks over his balcony. "Hey! It's Harvey Kurtzman! he's in the pool with three chicks! And they've all got their clothes on!" Harvey was mortified. The 'graphic novelists' at the writers festival launch party. Nobody here knows who we are. And I'm standing talking to young Leigh Rigozzi, planning our assault upon the literary world. A pretty young lady arrives, walks across the room through the throng straight to Leigh and asks if he would sign her autograph book. "How come Leigh is recognised when he's only been in town a few hours, while I who have been here twenty years am invisivble?" I ask, rudely self-important. And the pretty young lady says "I'm the one who picked him up from the airport." update: Guy Delisle can't make it alas. More room for Campbell's head, as one of my pals said. The plan: I'm going to head out of here at four, meet the Festival coordinator and put her mind at rest that I know what I'm doing in regard to these various panels, in spite of my 'insane rant' of a couple of weeks back. I will deftly demonstrate my command of the subject at hand, my familiarity with the work of the various guests and show that I am certainly the man to be trusted with the task. Then my pal White will turn up and we'll have a couple of 'afternoon looseners' and some eats before proceding to the festival's opening party. Eating out with White is always fraught with difficulty, or at least the 'afternoon looseners' part of it. I was sure I had told the anecdote on my blog, but can't find it, about how he got us all arrested one night. Present were Mick Evans and, this is the tricky part, wee Cal, aged then about nine. Chalky's argument was over the wrong sauce that had been served on his gourmet hamburger. He demanded that the chef come out and discuss the matter. The chef refused to come out. White refused to pay. He instructed the waitress to tell the chef that we would set up office in the coffee house across the road until the chef came down from his perch. Half an hour later the constabulary came and removed us from the coffee house. The belligerent one was prepared to get locked up over the difference between 'cordon bleu' and 'blue cheese'. We were stuck for a couple of hours at Police H.Q. and once we had paid the bill and were out I made the wee one swear to secrecy, otherwise his dear mother might not let him go anywhere with us again. But then I went and told the yarn at a dinner party a few weeks later, and as I looked around the table at the guffawing faces, my eye fell at last upon that of the wife of my bosom, transfixing me with the glare of Medusa. "Next morning I had garlic breath and thought it odd. Then I went through my pockets and found some change and the bill. I was stunned. I would never have known had I not found the bill. I just hope I left a tip. "A science fiction biography? I was baffled." 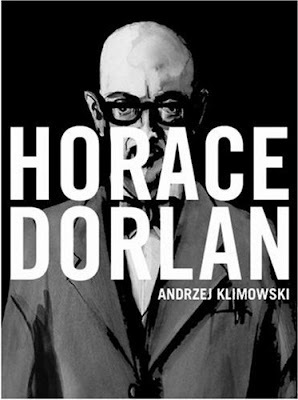 I read Andre Klimowski's Horace Dorlan on the plane on monday, shoved into my mitt the other day by my pal Best, who co-wrote The Amazing Remarkable Mr Leotard with me (our names were last aligned in print on an Escapist 13 page story a couple of years back). I had read a couple of reviews of the book which attempted to describe the set-up of the plot, about an academic who is to give a seminar in Pisa and late in the process changes the plan to include a jazz band. This implies that the plot is important, which of course it is, but also that it will lead somewhere which of course it does, but not in any way that would satisfy a reader who mistook it for a commonplace story. 'It is and it isn't.' Ed started to pace up and down the room, hands clasped together with index fingers resting on his mouth, like a lecturer reflecting on what he had just delivered. "You could call it a novel, but I prefer to call it a science fiction biography." This is another of those books in which we have taken a special interest here at Campbell.blogspot, in which the areas between mediums are blurred. Almost exactly half of the book is prose and the other half is uncaptioned images in the manner of the woodcut novels of the 1920s/30s, of Ward and Masereel etc. and the modes are all mixed together and alternating. Klimowski goes some way to evoking the white-on-black feel of woodcuts though I suspect the effect may have been achieved with the more economical medium of scraperboard. One significant sequence told in prose is later mirrored exactly in sequential images in a different part of the book. There is no linearity here. There are observations which, with no context to otherwise shore them up, we at first take to be metaphorical and then later find to be literal. But then that also is not quite true. There is no 'literal' in this book either. It is book 'writing' of the highest order, and I'm filing it fondly with the other items under my 'new books' label below. Here is a great selection of his poster art but the short bio looks faulty. Those posters are gorgeous. I bet my pal John Coulthart has already linked to them. The Royal College bio page looks better: Born in 1949 in London, Klimowski studied painting at St Martins School of Art, London and poster design at Warsaw Academy of Fine Arts. Horace Dorland is described there as a Work in progress... An experimental novel moving from text to pictures and back. The fragmented narrative is full of pathos and black humour, and deals with the loss of hearing. Nicki Greenberg saw me off from Melbourne yesterday, and I arrive back in Brisbane to find that she's here too. Waddayaknow! this is from the Brisbane Courier Mail, tuesday. It's a tabloid sized paper, so this spread is the equivalent of an old broadside page, with colours and a photo, and not a single ad. I heard this story on the taxi radio yesterday; it's online in a number of places. Study pits liberal brains against conservative brains. It interested me on account of all the stupid arguments I get into in spite of all I do to avoid them, about the naming of things (the 'graphic novel' etc.) I can't find a version that uses the quote exactly as I heard it, to the effect that conservatives demand rigid structures while "A higher tolerance of ambiguity and complexity is typical of people who are liberal. That’s not a surprise. It does, however, suggest there may be a hereditary and neurological basis..."
These are all evening appearances , in contrast to Melbourne which were all during the day. Eddie Campbell in conversation with Bryan Talbot. Brisbane’s award-winning graphic novelists Campbell and Talbot discuss their work as it relates to the larger history of illustrated literature. Bookings essential. Tickets $12/$10 at PowerTix. Join Nicki Greenberg, Guy Delisle and Leigh Rigozzi, three of the sharpest self-styled graphic novelists, to discuss how they use their everyday lives to produce acclaimed graphic novels. 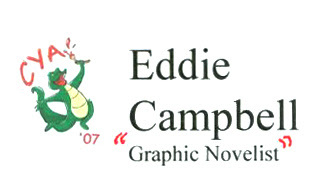 Chair: Eddie Campbell. DOES THE LITERATURE OF OUR TIMES HAVE PICTURES? Eddie Campbell, Guy Delisle, Bryan Talbot and Shaun Tan. 15th September 2007, at the QUT Creative Industries Precinct in Kelvin Grove at 2.50 to 3.30.
topic: The Graphic Novel Manifesto. The end of the world, not. Here am i am today with nothing important to say, and I went and posted twice yesterday. Why didn't I save one of them over till today? Well, you see, I had this premonition the world would end. Or as Alan Moore once said to me when he was way behind with his taxes, 'Imagine if the world ended tonight and you were hugely in arrears with your income tax. Wouldn't that be brilliant!" So I awake today, the world is still here, and I still have to be in front of a tv camera tomorrow. And I'm up to date with my taxes.